Young pilot Branson (Louis KOO) recently takes over Skylette, his father’s aviation empire, only to realize his old flames Cassie (Charmaine SHEH) is a flight attendant there. Several years ago, he was forced to break up with her and move to New York to take care of his father’s business. To this day, the two continue to harbour feelings for each other but decide to keep them bottled up. In an effort to rebrand the airline, Branson invites rock idol TM to star in an upcoming commercial and appoints Sam (Francis NG) as her flying consultant. Incongruent in both tastes and experience, this odd couple gets off on the wrong foot. As the shoot progresses, however, they slowly discover each other’s merits, developing a strong mutual attraction. Jayden (Julien CHEUNG) has left Skylette Airline to become a pilot for private jets. He meets the young and vivacious Kika (KUO Tsai Chieh) during a flight and assumes her to be wayward and shallow. But they turn out to have a lot in common and start falling madly in love. At the height of their romance, Jayden realize almost too late the secret behind her recalcitrance… Each of the three relationships comes with its own setbacks. As long as one can accept the imperfection of things, finding happiness—however fleetingly—is a blessing in itself. Triumph In The Skies (冲上云霄) is perhaps one of the most anticipated Chinese film ever since TVB announced the making of the movie. Although it was said to be a spin-off from the drama, all the die-heart fans were still looking forward to the film. I caught the first drama 12 years ago, but when the sequel came out in 2013, I did not have time to catch it before this movie was out. Given that I did not have the prior knowledge of sequel, I still find the film quite enjoyable and watchable, displaying 5 love relationships within the short span of 100 minutes. I love the magnificent and beautiful cinematography, especially those in England. Together with the strong cast, the film was indeed visually-appealing! Besides that, I like the little stories you learn from the individual couples. Messages like “Life’s short”, “Opposite attracts” and “True love overcome all obstacles” were significant (Won’t elaborate too much to avoid more spoilers!) Furthermore, the cameo appearance of Roy (Kenneth Ma) and Sister Head (Elena Kong) was memorable despite the limited screen time. However, audience who have watched the drama might be a tad disappointed with the film. Some find the addition of so many new casts Louis Koo, Charmaine Sheh, Sammie Cheng and Amber Kuo dilute the presence of the two most popular reprising characters Captain Cool and Sam. Louis Koo and Charmaine Sheh’s love story made the movie look as if it was revolving around them rather than the original cast. Also, Captain Cool and Sam did not really have a continuing plot with their characters in the drama. Some find Sam’s (Francis Ng) role too romantic with TM (Sammi Cheng), different from his original cold and stern character. Rather than over-analysing this film, I find it a light-hearted yet touching movie suitable for couples (Valentine’s Day is over but you still can watch it with your loved one) and also friends! Most importantly, this is good as a stand-alone movie and you don’t need to watch the dramas to understand this! The film was directed by two veteran Hong Kong directors: Wilson Yip and Matt Chow. Wilson Yip, is best known for directing “Ip Man” and “Ip Man 2” while Matt Chow was famous for his romantic comedies such as “Golden Chicken SSS”. The bathtub scene was shot in England at 2 degree Celsius for eight hours. It wasn’t enjoyable as they were not able to turn the water’s heat up because doing so will fog the cameras up. Chilam’s crying scene during Amber’s high-risk surgery was unscripted and real. He shared, “The director didn’t ask me to cry, but once [the cameras] rolled, I couldn’t hold [the tears] in. Check out Triumph In The Skies (冲上云霄) Facebook Page and Weibo Account! 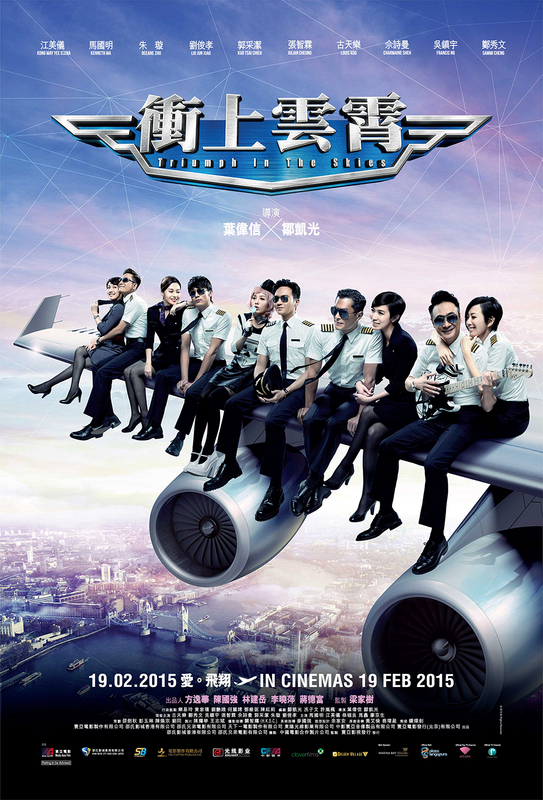 Triumph In The Skies (冲上云霄) is out in cinemas on 19 February 2015. Tiffany, I’ve bookmarked a number of your videos so I can sit and watch them one weekend. One of my best friends is a flight attendant and she’d love this movie too. The concept of the love angles look really interesting. It’s something you’d follow until you get to see who ends up with who. Well lats time I was riveted by Mahjong now this, You do know how to tell a good story. I am tempted to go find this movie and watch it! Do you have to watch the first part to understand the second part? The bathtub trivia was interesting and funny! You don’t need to watch the drama to understand the movie! Watched both part 1 and 2, and was excited to watch this movie with my family with the aim of letting the children have a view of what the cockpit looks like. In the end they only get to learn that the cockpit seats 3 pilots and nothing more. Too many kissing scenes which is definitely not appropriate as a family movie. The drama itself was much more fun and more wholesome. Great film for sure. Looks like a big production. I have a feeling that this is a big hit! OMG! I will definitely watch this movie. I love ChiLam he is so cool in that movie. Its just pure enjoyment to watch their love stories. I heard a lot of friends who watched this said its storyline is very poor. But your review seems it is still not bad. I was wondering whether I shall go watching it now. Hmmmm…. You should watch it just to support the film. The storyline is a bit simple, but I think the cinematography and acting is still worth the watch! not familiar with the film, and as much as possible I stay away from watching drama films. Still, this is a good choice for those tearjerkers movie fans. This is one of the film that I want to watch—I am fond of an airplane, a stewardess work and I really admire pilots. And reading your review, I am more curious on their bath tub scene..great to know how they act out of those scenarios. i don’t like films/dramas from hk :/ even if its dubbed in mandarin. something about them but louis koo is HOT!